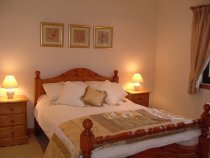 Lawford Lodge, self catering holiday cottage in Central Scotland. Lawford Lodge is a new and modern built house amidst beautiful Scottish countryside overlooking the Ochil and Campsie hills. 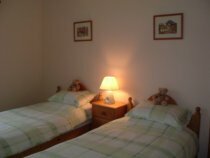 Our three bedrooms are good sized, two double and one twin, we also have a cot available if required. 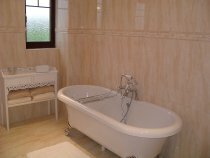 One double has an en suite shower room. There is also a fold away bed available. The open plan lounge is very comfortable and cosy with freeview television, selection of books, games, dvd”s, and childrens toys. 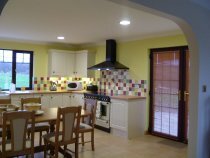 The kitchen is very well equipped with a range cooker, washer/dryer, microwave, dishwasher/ iron ironing board, kitchen linen is also provided. There is also a highchair available. The lounge and kitchen both have French doors leading onto a decking patio for you to sit and relax and admire the view, or maybe have a meal on a summers night. © 2007-2011 Lawford Lodge. All rights reserved.